It’s with sadness that we heard about the death of poet, author and activist Maya Angelou, who passed away at her home in North Carolina yesterday. Read Paul Laurence Dunbar’s poem in full here. She went on to write her own poem called Caged Bird, as well as many more that have enthused and inspired readers. 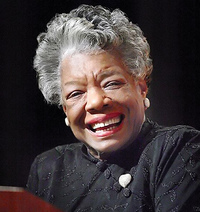 Perhaps her most famous work is Phenomenal Woman, which has been read and enjoyed in our shared reading groups, and is surely a point of encouragement for many females across the world. There’s no doubt that her inspiring legacy will live on through her work, and encourage a whole new generation of readers. Previous Previous post: English or American literature on the syllabus? Next Next post: Much Ado About Nothing: Only two weeks to go!